In the latest news detailing what many are calling a huge injustice, the homeless are now being given citations by police officers for setting up camp in abandoned lots; lots that are, in many cities like New York, the only places the homeless have to go. According to the federal government, more than 30 percent of the homeless have no shelter whatsoever, and that number is growing because, although there are fewer homeless people in general, soaring housing costs and a lack of subsidized or even rent-controlled housing has pushed more families into encampments in the cities. This—in combination with gentrification in older neighborhoods, general housing shortages, and the presence of difficult conditions in homeless shelters—has left people with nowhere else to go. As a result, many are now calling the crackdown against the homeless the equivalent of punishing people for being poor, which raises alarming civil rights concerns. Many people who are on the streets are there due to physical and/or mental disabilities or illness, or because they have lost their jobs. Yet, in response, many cities are now passing laws known as bans on “urban camping”; laws which appear to be little more than prohibitions on resting; an activity that many would call a basic civil right. As a result, many are now challenging these anti-camping ordinances and corresponding misdemeanor citations. 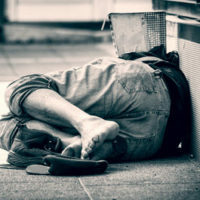 What’s perhaps even more shocking is that, in 2015, the Justice Department warned states that laws like these which criminalize homelessness could be violating the Constitution’s protection against cruel and unusual punishment. In spite of this, the National Law Center on Homelessness estimates that half of all American cities now have these anti-camping laws. Not only are these laws arguably unconstitutional, but they are simply ineffective in addressing the underlying causes of homelessness and also expensive to taxpayers. Instead of penalizing people who have nowhere else to go, cities should be instead creating permanent housing for homeless residents, as well as a housing fund for low-income families and programs to employ people living on the streets. Officials should also be making shelter space more available and sending out outreach workers to visit camps prior to police dismantling them in order to provide some guidance to those who might need these services. It is not a crime to be poor and homeless. Every day, many innocent people are criminally prosecuted without actually having committed a crime. If your civil rights have been violated and you are facing a citation or criminal charges as a result, contact our office today. Criminal defense attorney at law Phillip J. Murphy has been representing innocent victims throughout New York and New Jersey for more than 25 years. We are here to help.